When the gym is boring you and you're sick of your running route, it's time to upgrade your fitness regime. So how about some SUP (stand up paddle) yoga, maybe some longboarding and a bit of wakesurfing with active brand GlideSoul? This was how I ended up spending my Saturday; nothing else could have got me out of bed in my warmest clothes to trek over to Active 360 at Kew Bridge. 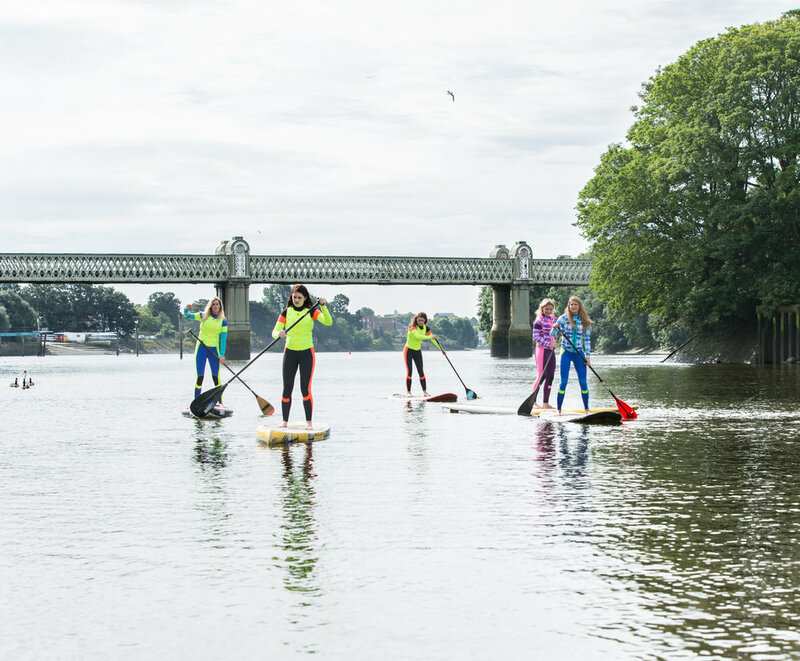 However, I was soon kitted up in some amazing GlideSoul gear, handed a paddle board and then pushed out onto the Thames. Half of us went for some basic paddle boarding and then the other half did yoga, before switching. I've paddle-boarded before when I was in Thailand so wasn't too worried about going in, unless you counted the various diseases in the Thames. But it was such a beautiful day to be casually floating down the river, especially when going down stream. However you could definitely still feel it in your abs and arms as you steered, and a much more exciting workout than some sit ups and press ups. And if you thought it was hard going downstream, heading back up against the current was one of the biggest work outs of the day because good god it was tough. You stop paddling, you go back a couple of feet so ten minutes of that and I was sweating in my suit. Onto the hard part; I love yoga as much as the next person, however I'm always struggling with my positions. So when I was told I'd be doing yoga on a very wobbly paddle board, you could say I was dubious and had strong suspicions I'd be the first to fall in. Trying to get the moves right turns into trying to just stay on the damn board. So whilst you may not be nailing the moves as much, your core is engaged the whole time trying to keep your board straight that you get a much much harder workout than yoga on land. After a quick snack stop (where I discovered a newfound love of monkey nuts which we all frantically deshelled in our hungry state) and a drive down to Chertsey, we were at the JBSki water park, right next door to Thorpe Park. With zip lines and boats for water-surfing, you could easily do a whole day out there. However the next part of the day didn't quite go according to plan. Before we got onto the water-surfing we decided to do some long-boarding as we had some of the pros to show us how to do it. I've always been a clumsy person (with over 12 scars and counting) but I'm also someone to throw myself into anything. However one cocky move later, and I'm on the floor with a busted ankle that is swelling up every minute. Spending the remainder of the day sitting with a huge ice pack on my absolutely huge ankle, later finding out that I'd ripped the ligaments in it. It's over two weeks later and I'm still struggling to walk up stairs and walk in sandals. So you could say I was pretty disappointed, as I'd wanted to try wakesurfing ever since my ex-boyfriend did it. However, the amazing team at GlideSoul, not only some of the nicest, warmest (and bloody awe-inspiringly buff) people who looked after my clumsy self, but they even made sure I was still a part of the whole day even if I couldn't do much. Being out on the boat was half of the fun, so I schlepped on and joined the surfers for, whilst not being able to do it myself, an amazing session of wakesurfing. It blew my mind how effortless they made it look, especially GlideSoul's CEO Alena Pishchulina who is a wake-surfing pro. If you want a work out that's a bit different, then I would recommend every single one of the activities I did. Paddle-boarding is a great calm way of starting your day, especially with some yoga added in and where an hour of exercise seems to fly by. Long-boarding is perfect for people who want some speed on the ground, and wakesurfing is the extreme sport that will challenge you yet something you'll see progression in pretty quickly if you put the time in. Despite busting my ankle badly, my abs still ached the next day and feel that an hour doing one of these is an hour much better spent. Thanks so much to All Conditions Media and GlideSoul for looking after me, especially Jo, Fee and Georgie who looked after my every need as the injured!